Red Wine Popsicles - Sangria on a Stick! 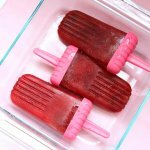 Red wine popsicles are the ultimate grown-up summer treat! Cool off with a blend of fresh fruit and your favorite red wine - it's sangria in frozen form! Combine water and sugar in a saucepan over medium heat. Bring to a boil and continue cooking until the amount of liquid is reduced by half and all sugar is dissolved. Add the gelatin, stir until dissolved, then remove from heat. Allow mixture to cool to room temperature. Chop your fruit into pieces that will fit in your popsicle molds and set aside. Puree the other half of your fruit. In a medium mixing bowl, combine the cooled gelatin syrup, fruit puree and red wine. Arrange the fruit pieces you set aside earlier inside your popsicle molds. Pour wine mixture over the fruit in your popsicle molds. Freeze until set, ideally overnight.